When you walk into the Kentucky State Capitol you will see this commanding bronze statue in the rotunda. It was presented to the Commonwealth of Kentucky by James Breckinridge Speed of Louisville, who donated $40,000 for its creation. On November 8, 1911, President William Howard Taft dedicated the work, one year after the building opened. The 14-foot statue is surrounded by smaller works depicting other famous Kentuckians such as Henry Clay and Jefferson Davis. 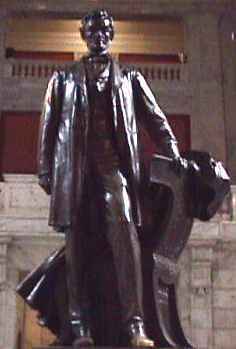 Sculptor Adolph A. Weinman also designed the statue of Lincoln in Hodgenville, Kentucky, near Abraham Lincoln's birthplace.